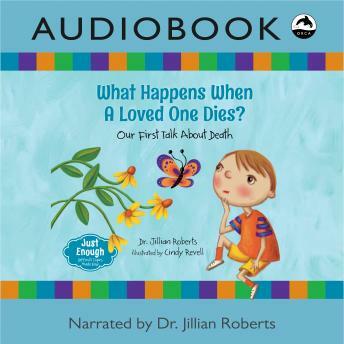 Whether children are experiencing grief and loss for the first time or simply curious, it can be difficult to know how to talk to them about death. Using questions posed in a child's voice and answers that start simply and become more in-depth, this book allows adults to guide the conversation to a natural and reassuring conclusion. Additional questions at the back of the book allow for further discussion. Child psychologist Dr. Jillian Roberts designed the Just Enough series to empower parents/caregivers to start conversations with young ones about difficult or challenging subject matter. What Happens When a Loved One Dies? is the second book in the series. For more information, visit www.justenoughseries.com.